St Bede Academy is a large, three-form entry primary school in Bolton. It has 150 computers on site. St Bede also has a sister company, St Bede Childcare, and that manages four nurseries around Bolton, Wigan and Leigh. These are all connected into our St Bede IT infrastructure and managed by our IT team. St Bede is becoming an academy trust and will hopefully be sponsoring another school in Bolton. What are some of the main IT challenges you faced before NetSupport DNA? Prior to NetSupport DNA, we didn’t have any solutions that really worked for us. The main issue was that we had to travel 20 minutes to and from the nurseries to fix any problems they had. Sometimes it was something simple like just needing the Admin password entering; a job that could have been done remotely in seconds. We had no IT inventory documentation and no eSafety monitoring that we were happy with. So with the school growing, we needed to find a way to address these issues. 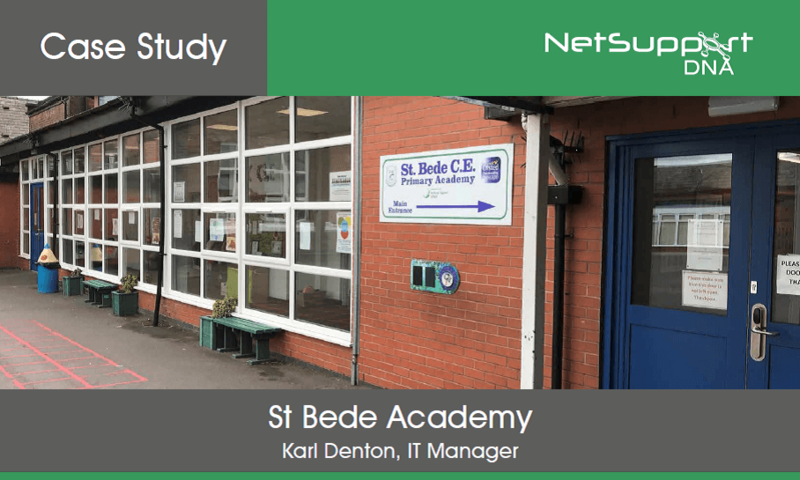 How has NetSupport DNA helped the IT team at the school? It has helped us become much more efficient. In regard to the nurseries, we no longer have to travel as much – the issues can be fixed remotely and it’s saving the IT team several hours per week and means that they can concentrate on other tasks. DNA quickly found all the computers on our network (showing the hardware specs and the software installed), so it has enabled us to plan an upgrade programme across all sites – we didn’t have to go around and manually find out what software was on them all. It’s now our key eSafety and internet monitoring software, helping us quickly identify any potential issues with pupils searching for specific subjects – and our DSL can now deal with these directly. DNA has already helped us to save several hundreds of pounds of energy costs. Before, staff were leaving computers on every night. Now, PCs are scheduled to shut down at a set time, which has eliminated that waste. It’s probably our most used feature. Our site is quite large, so when staff log a support call, we can instantly fix their PCs, which means they can continue with teaching and learning with limited disruption because they’re not waiting for a technician to walk over to the class. In terms of the nurseries, it’s saved us several hours in travel time as well. For us, the benefit is that it works really fast, even over our internet connection – between sites, there’s no lag at all. How does NetSupport DNA help with supporting your safeguarding efforts? Managing safeguarding alerts isn’t really an IT job (although IT teams often do it), as we’re not aware of what the pupils are learning – they could be researching something that triggers an alert and it’s legitimate. So the fact that our Designated Safeguarding Lead can log on in this role is much better. She is more connected with the pupils and is in a better position to decide whether an alert is a real concern, rather it be left for us to decide. What do other staff in the school think of NetSupport DNA in terms of usability? They are amazed by the fact we can remote control onto PCs quickly, so they can continue with teaching and learning. But, in a positive way, they’re not really aware of anything – apart from the energy monitor shutting their machine down! I’ve always found that the support team are always on hand to fix any issues and they are happy to help for as long as it takes. We wanted to do a server migration, and they were on the phone for a couple of hours, until it was sorted out. How does NetSupport DNA compare to previous solutions your school has used? When we demoed DNA, we really liked the way that it ‘just worked’; you could plug it in and it worked with everything – and that has continued to be the case. We very quickly got it installed and it was working out of our network, we could see all the hardware and software and use all the features straight away. How do you see DNA supporting the school’s IT into the future? DNA will prove even more useful to us in the future when we become an academy trust and take on the new school. I can see us using features like software distribution, SNMP discovery and reporting a lot more which will save us time and ensure we remain cost-effective.